You are here: Home / What is Ozone? Without ozone, life on Earth would not have evolved. The first stage of single cell organism development requires an oxygen-free environment. This type of environment existed on earth over 3000 million years ago. As the primitive forms of plant life multiplied and evolved, they began to release minute amounts of oxygen through the photosynthesis reaction (which converts carbon dioxide into oxygen). The build up of oxygen in the atmosphere led to the formation of the ozone layer in the upper atmosphere or stratosphere. This layer filters out incoming radiation in the “cell damaging” ultraviolet part of the spectrum. Thus with the development of the ozone layer came the formation of more advanced life forms. Ozone is a form of oxygen. The oxygen we breathe is in the form of oxygen molecules (O2) – two atoms of oxygen bound together. Ozone, on the other hand, consists of three atoms of oxygen bound together (O3). Most of the atmosphere’s ozone occurs in the upper atmosphere called the stratosphere. Ozone is colourless and has a very harsh odour. Normal oxygen, which we breathe, has two oxygen atoms and is colourless and odourless. Ozone is much less common than normal oxygen. Out of each 10 million air molecules, about 2 million are normal oxygen, but only 3 are ozone. Most ozone is produced naturally in the upper atmosphere or stratosphere. While ozone can be found through the entire atmosphere, the greatest concentration occurs at an altitude of about 25 km. This band of ozone-rich air is known as the “ozone layer”. 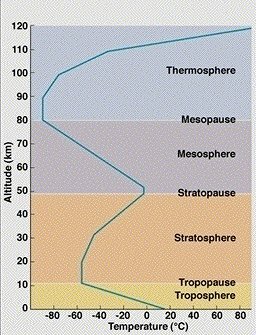 The stratosphere ranges from an altitude of 10km to 50km and it lies above the troposphere (or lower atmosphere). Stratospheric ozone shields us from the harmful effects of the Sun’s ultra-violet radiation. Ozone also occurs in very small amounts in the troposphere (200 parts per billion). It is produced at ground level through a reaction between sunlight and volatile organic compounds (VOCs) and nitrogen oxides (NOx), some of which are produced by human activities such as driving cars. Ground-level ozone is a component of urban smog, and can damage certain crops and trees, and can be harmful to human health. As there is increased solar radiation during the summer months, there tends to be a larger number of urban ozone episodes at this time. Ground level ozone is blown easily by surface winds to regions well beyond its source. As a pollutant it should not be confused with the separate problem of stratospheric ozone depletion. Even though both types of ozone are exactly the same molecule, their presence in different parts of the atmosphere has very different consequences. Stratospheric ozone blocks harmful solar radiation – all life on Earth has adapted to this filtered solar radiation. Ground-level ozone, in contrast, is simply a pollutant. It will absorb some incoming solar radiation, but it cannot make up for stratospheric ozone loss. This fact sheet series is concerned with stratospheric ozone depletion.